We are Manufactureres & Suppliers of Quartz Glass Heavy Wall Tubes with heavy wall thickness to with stand high Temparature to work with.We take custom made jobs for our client. Before the final dispatch, these products are tested on various parameters to ensure their flawlessness. 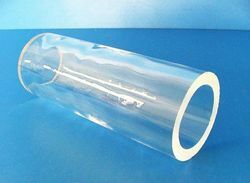 The transparent quartz tube is obtained through different types of raw materials that include natural or synthetic quartz sand. Quartz tube have ultra high purity, good spectral transmission, well controlled dimensions and lower (OH) Hydroxyl. 1.: Quartz Jackets for UV water purifier. 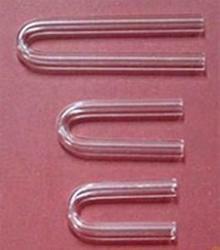 2.: Transparent Quartz U tubes for expendable thermocouples. 3.: Mercury Vapor Lamps, Metal Halide lamps and Halogen Lamps. The combination of ultra-high purity and dimensional control translates into excellent attenuation for optical fiber. Each fiber-optic quartz tube produced by Momentive is serialized, characterized and accompanied by a data slip showing the complete geometry of the tube, demonstrating the outstanding consistency of the product.